Thank you all for your comments on my camping adventures. My husband and I read your comments and he got a kick out of how many people said "Something touched my foot, I'm OUTTA THERE!" He admitted he was scared too though and wanted his heart to stop beating so loudly so he could hear what it was out there!! Unfortunately, the only way we could hightail out of there would be to pack up our gear and cycle out. So not really much of an escape route. When I went back to school last week, I chatted with the Grade 4 teacher and she said she has a cabin right before you head into Smuggler's Cove. I asked her if she heard the blood curdling screams in the night. Lol!! Anyways, she said the next time we are there, if we need to stock up on water we could come by. Nice to know there's someone nearby that I know! Well, the last week I have been very busy with school and catching up with friends. I had another great sewing day with my cousin-in-law and she and I craft-bombed my apartment. I managed to finish sewing up the panels of my quilt and she made two cute little pants for her baby to be. Check out our progress! Her pants are adorable. We love that chicken fabric we found at Dress Sew. She made similar pants with guitar fabric as accents but I forgot to take a photo of them. I still have yet to cut out the border and panels for my quilt and I hope to soon, after I get over the fact that my panels are slightly off. Very hard to stitch straight!! While we were sewing and being productive, I found something I made in my Grade 12 textiles class. I remember designing it to represent my Russian and Irish sides but never finished it into a pillow. I hope to finish it soon so I can actually use it. I also received in the mail my trim pack that I won from Nancy at Victorian Motto Sampler Shoppe. I chose the Halloween pack, although I don't celebrate or stitch anything Halloweeny, I loved the autumn colours and will use it for my smalls. Thank you Nancy! I love her stuff!! On Wednesday, I had a lovely visit with Melissa from Words and Blooms. She came over to my Nana's and brought me batting for my quilt. So generous of her!! She also gave me a beautiful cross stitching Christmas book with a pattern she had stitched awhile ago that I commented on. You are amazing Melissa for remembering that I loved that pattern! I'm hoping to stitch it for Christmas this year. We had tea and chatted about all sorts of things. I always enjoy visiting with Melissa! Hugs to you!! Of course with school looming over me, I felt I had to surge ahead on Hannah. I'm finished one corner and hope to finish the other soon. I'm really excited about finishing her but sad at the same time because she has been fun to stitch. I always leave my 1 over 1 stitching till the end. I also picked up Knotgarden last night. I haven't stitched on Knotgarden for months. 6 more blooms to go! Love that little deer leaping!! 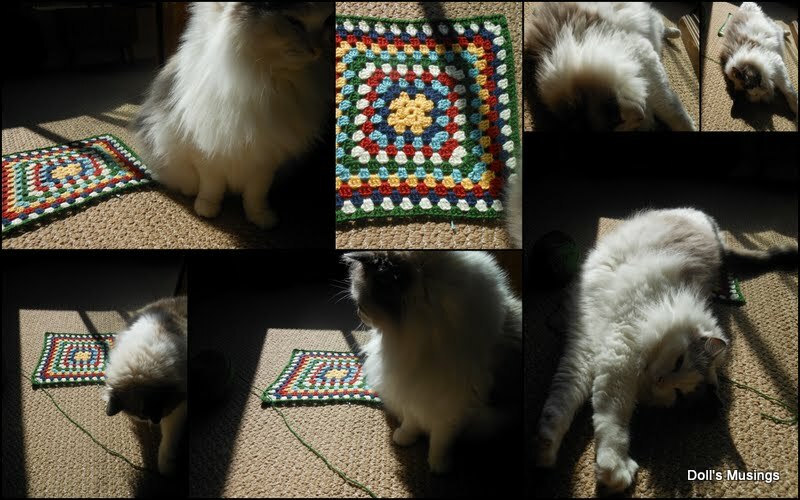 As for my granny square blanket, I have been adding a row a day or every other day. Usually I crochet in the morning with Titus lying beside me in a sun beam. He decided to roll around on my mini blanket just to add a few more of his hairs into the yarn! After all those wilderness photos, I thought I'd be a bit civilized and show you some city scapes. Well, I think that's about it for today. I still have not decided about what to do with my giveaway. If you have ideas please share with me! I was thinking of having 3 winners for my 3 years of blogging. Perhaps something stitched for 1, a gift card and some stash? Really can't decide! PS, Adding photos on blogger has been really odd lately. It's taking forever to add just one photo. I get that circle thingy that changes colour, like a wait symbol, but find it never adds the photo unless I click on it a gazillion times. Anyone else having this problem? I use Mozilla and Picasa. Chrome doesn't work well for me. Cheers until the next post! Hopefully the first week of school will go smoothly!! What a lovely post Ann.I really like your grade 12 textile pieces. I think that is super that you are finally going to finish them off. Wow! Where do I begin to comment on all the lovely things in this post? Hannah is magnificent and the cute little baby pants are adorable. Love the original embroidery design. Great work on the quilt and how lovely that you are able to get together with Melissa. Anne, I'm so glad we got to get together before your work (and one day hopefully mine) starts! It looks like you've been trying to cram all the stitchy stuff in before you start work again - good for you - and I see lots of wonderful things. You are so close to finishing Hannah! Here's hoping you get a great class of kids this year! Great stitching and good luck with the start of school! Hannah is so close to being done! She is gorgeous! Love both your firebird and shamrock. The colors in your quilt top are just perfect! Good luck with the coming school year! I really enjoyed this post and seeing all the goodies! You were very good in grade 12!! Wow! Love Hannah! Love everything! As for posting pics -- that's strange. i noticed that red circle this morning too, but it only appeared quickly and then went away and everything was normal otherwise. I wonder what's going on. I use Chrome. Your quilt panel looks awesome! I love those colors. Your stitching is so lovely and I can see why you will miss this project when you're done. Oh, I have that pattern on my to-do list as well! I just love those books and have been working at expanding my collection over the years. I don't even know where to begin ~ fabulous post! Love all of your projects ~ those little pants are adorable! How fun that you and Melissa were able to get together ~ it's always nice to spend time with stitchy friends. The book/pattern she brought for you is beautiful. Oh my Anne, you've been a busy lady. The quilt you are making looks gorgeous, it's all in the alteration of the colours of the stripes. And it works great. Lovely stitchy projects, too. And when Hannah is finished the next project is already waiting for you. I have seen Lo an many blogs and it's a really beautiful project. So nice that you were able to have a get-together with Melissa. She must be a lovely lady. LOVE your quilt!! !darling baby pants. And what beautiful stitching you had done back when:) Lovely gifts from Melissa great that you both were able to get together. Knotgarden is so PRETTY and your so close to being done!!! So many pretties! The quilt looks fabulous! What a treat to see your grade 12 project, and original design no less! definitely time to give it a finish. You sure are an active crafter! Great post, Anne! You are one talented lady with your sewing and quilting. Hannah is in the home stretch and looks wonderful. I love the colors you have chosen for your quilt. How cute are those little pants? How kind of Melissa to share a special day and treat with you. I love that pattern.....another "to-do" in my waiting stash. Nancy's trims are lovely, congrats on your win! Best of luck to you in the new school year. It's hard to believe that it is September already. An amazing post, really interesting...love the sampler, amazing colours. The quilt and pants are awesome! Love the fabric choices. I had to get one of those Halloween trim packs the second I saw them because the colors are so awesome. Love those little packs she does. Great sewing, those pants are very cute! Great post. I really need to see more of Knotgarden! Can't help with the photos, I use Chrome and Photobucket. I can only add photos from Photobucket if I copy the HTML code and switch to HTML mode! Oh, I'm so jealous that you and Melissa got together! Two of my favorite blogging friends in the same room sounds like a wonderful time to me :) How sweet of her to gift you with the Lo, How a Rose Sampler book! How cute to see Titus helping you with your crocheted blanket :) Everything looks great--stitching, quilting, AND crocheting!! Look forward to seeing your quilt all finished up.And those trousers are just cute. You must have had such fun piecing your beautiful quilt, and what adorable baby pants your friend made too. Hannah is gorgeous! You must be so anxious to finish her. Lovely progress on 'Knotgarden' too...can't wait to see more of it. You must be having so much fun, crocheting your Granny Squares blanket. One of my favorite blankets, was a Granny Square blanket, made for me. I just loved all of the pretty colours that made it up. Hope that your days, back in school, are going well for you, Anne. Really enjoyed reading your post and what fun that you and Melissa spent time together! I'm hoping to finish Lo How a Rose for Christmas so it will certainly be do-able if you decide to get started on it. Your quilt is quite the masterpiece! As is your stitching on Hannah. I also have that book, and made a small start on LO How a Rose, but it won't be done THIS Christmas sadly. Enjoy! Hi to Titus too! Hugs! You got some beautifull pieces!! You've been super crafty! I bet there's a lot of cool things in that Christmas book. Lovely city scapes :) It's always nice to see where other people live.